Made each year by Stephanie’s friend, Jay. Mix graham cracker crumbs, butter and sugar together. Press against bottom and sides of a nine-inch spring-form pan. Beat cream cheese until light and fluffy. Continue beating and slowly add one cup sugar. Add eggs, one at a time. Stir in one tsp vanilla. Pour over crust. Bake in a preheated oven at 375 degrees for 45 minutes, or until set. (Often takes longer!) Beat sour cream at medium speed for two minutes. Add ½ tsp vanilla and sugar. Continue beating for one minute. Spread over hot cheesecake. Bake at 400 degrees for five minutes. Cool on wire rack. Cover and chill for at least eight hours. Stephanie says: This cake would also be delicious with an orange cream cheese frosting. Heck, bologna could be delicious with enough cream cheese frosting. Preheat oven to 325 degrees. To prepare the orange syrup, stir together orange juice and sugar until completely dissolved; set aside for spooning over the baked cake layers. To make the cake, sift flour, baking soda and salt together onto a piece of wax paper. Beat the butter and sugar together until light and fluffy, then mix in the eggs one at a time, incorporating each egg completely before adding the next. Blend in 1/3 of the flour mixture, then half the buttermilk; repeat, ending with the remaining third of the flour. Make sure each addition is fully blended before proceeding to the next. Stir in the vanilla and orange zest, and divide the batter between 2 round 9-by-2 inch cake pans that have been buttered, floured and lined with wax paper or parchment. Spread the batter evenly in the pans, and drop each pan sharply on the kitchen counter to remove any large air pockets from the cake batter. Bake in the preheated oven for approximately 45 minutes, or until a cake tester inserted into the center of the layers comes out clean. Remove the pans from the oven and cool on a rack in their pans for 20 minutes. Pierce the layers all over, about 1 inch apart with a toothpick or skewer. Spoon the reserved orange syrup over the cake, dividing evenly between the layers and allowing each addition to be absorbed before adding more. Allow the layers to cool completely in the pans. To fill and frost the cake, while the layers are cooling, whisk together the sour cream, heavy cream and sugar in a chilled mixing bowl. Whip until thick enough to spread, and refrigerate until needed. Once the layers are completely cooled, turn one out onto a cake plate, and carefully peel off the wax paper from the bottom. Heat the marmalade gently until it begins to liquefy. Spread two-thirds of the marmalade over the cake layer, spreading it all the way to the edges. Turn the remaining layer out directly on top of the first. Again remove the wax paper from the bottom, and spoon the remaining marmalade onto the center of the cake, leaving a one inch border around the edge. Frost the sides and top one-inch border with the reserved frosting, leaving the marmalade exposed in the middle. Refrigerate for two hours or longer before serving. Cake can be made the night before. Nana Hazel’s recipe, submitted by Stephanie: This is George’s favorite! Rich, classic, moist, and pretty foolproof, this cake forms a crunchy bottom that you can see in the second picture. It’s simple enough to make, but elegant and tasty enough to serve to your favorite guests. Beat butter until light and fluffy. Beat in sugar. Add vanilla and beat well. Add eggs one at a time, beating well after each addition. Sift baking soda and flour together. Add to mixture. Fold in sour cream. Bake in a greased and floured tube pan at 300 degrees for 1 ½ hours or until toothpick comes out clean. Stephanie got this recipe from a recent grad of Johnson and Wales. It is easy and tastes wonderful. Place vinegar and wine in a heavy bottom saucepan. 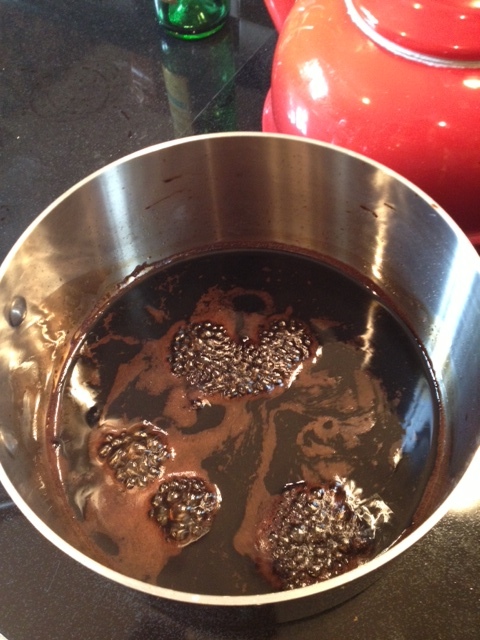 Heat at medium high until simmering; lower temp slightly and reduce liquid by 50-75% (4 cups turns into 1-2 cups). The longer it reduces, the thicker and sweeter it becomes. Serve drizzled on fresh tomatoes and mozzarella, sliced strawberries, ice cream, or straight from a spoon. Stephanie made these for both Thanksgiving and Christmas 2012. They are festive looking and very tasty, too. Each time she thought she was only going to make one batch, but guests clamored for another. Only running out of vodka put a stop to making a third. Mix the first three ingredients together in a large pitcher. Pour into ice-filled glasses, garnishing with fresh cranberries and a slice of orange. Having grown up in Tampa, George knows a good Cuban sandwich when he sees one (or rather, eats one). According to him, it should be made with Cuban bread. It should have roast pork. It should have pickles. It should be pressed. Anything less would just be a sub. Being in North Carolina and far from Cuba and its bread (or even a Publix), Stephanie took on the challenge to try to make as authentic a Cuban as she could. Lucky for her, it got two thumbs up. Open up bread and spread surfaces with both mayo and mustard. Evenly layer the meats, topping with cheese. Distribute pickles down the length. Assemble sandwich with top. Use a sandwich press if you have one, brushing the outer surfaces of the sandwich with melted butter and cooking on medium to medium high heat until golden, pressing and flipping once. The cheese should be starting to melt. Cut on the diagonal into as many pieces as you want – 2″ if you want to serve as an appetizer, otherwise into sandwich serving sizes. 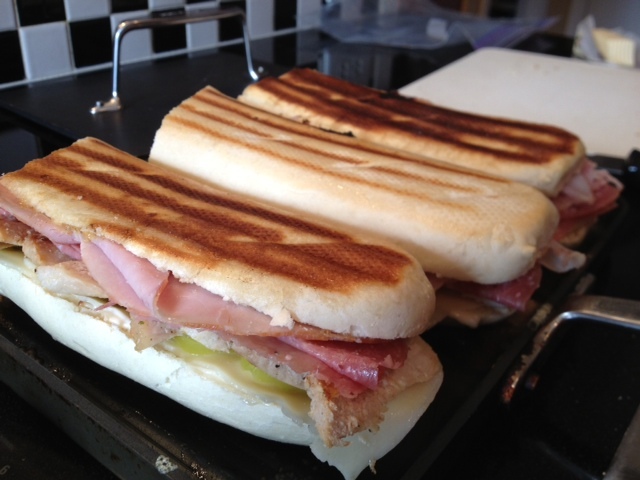 Makes one to two long sandwiches, depending how long your Cuban loaf is, and how high you stack your ingredients (warning: the more meat and cheese, the harder to press). *Stephanie cannot find Boars Head roast pork in NC, so she buy a small tenderloin, roast it in the oven and slice it as thinly as possible. **Cuban bread is difficult to find, so she uses the closest thing. 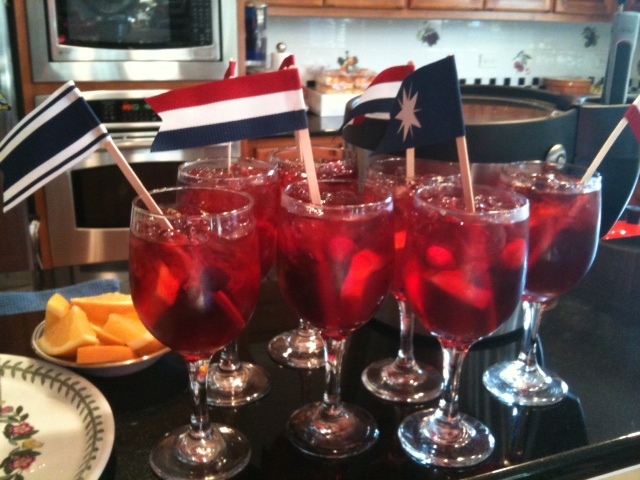 This refreshingly delicious drink is served at Savannah’s Pink House. Stephanie and her sister-in-law, Kim Stratton, walked all over Savannah for the ingredients and spent an hour in their hotel room perfecting the ratio of the ingredients. It was tough work, but so worth it. Mix in an ice-filled glass or pitcher, four parts lemonade to one part vodka. Add fresh raspberries to the glass as an edible garnish.